DIABETIC FRIENDLY - great for diabetics and for preventing diabetes and obesity! Breakfast sets the pace for the day! In our 'got-to-go' society, the trend has been to skip breakfast and 'grab something on the run' which more often than not has become coffee and a muffin or other sweet pastry; and give the kids some sort of starch and sugar in a box with low fat milk. This 'habit' has definitely helped fuel the Diabetic and Obesity epidemic throughout North America, not to mention the 'always hungry and tired feelings' we have throughout the day. Two hormones, insulin and leptin, are now clearly at the center of discussion and need to be understood in order to get this epidemic under control. Hormones are chemical messengers that direct, orchestrate and regulate all your body's activities. In Insulin Resistance, the body's sugar levels progressively increase in an attempt to trick the cell in absorbing more glucose, because elevated insulin levels gradually slow the process down. It leads to a vicious cycle of hyper and hypoglycemic events, and eventually, to many degenerative diseases including but not limited to diabetes, heart disease and cancer. Start your day with a high fiber, low complex carbohydrate, low glycemic, high quality protein breakfast with plenty of good Omega 3 oils. This keeps insulin and leptin levels low and triggers fat burning. Morning 'Power Smoothie' to the rescue! For years now, Dr. Bohemier, DC., of Innotech Nutrition has successfully started his day with this simple, easy and inexpensive recipe, which provides him with all essential amino acids, vitamins and minerals and essential fatty acids to carry him well through the day. It has eliminated morning sugar cravings and fatigue, further providing much needed energy and normal weight, which we all strive for. It's also one of many proactive things he does to prevent degenerative diseases and insure longevity. Let it further blend for only about 5 seconds, 'bump blend' or stir in by hand as blender blades can harm the structure of protein powders and should not be used except to blend or stir in the protein as a last stage of preparation. Voila! It's ready to go. If he's in a hurry, he pours it in a shaker cup with a lid and straw and off he goes. In addition, he consumes at least 3 - 6 grams of omega 3 marine mammal oil caps (higher in DPA than fish oils). All of his vitamins and minerals are included in Bodyflex AM. Do the same for the kids and watch them thrive! Many children who have used Bodyflex AM in the morning have the ability to sit still, concentrate and learn in school. Bodyflex AM contains Cold Processed Whey Protein Isolate, L-Lysine, L-Glutamine, L-Threonine, L-Proline, L-Aspartic Acid, a Multi-Vitamin, a Multi-Mineral, Glucosamine and is sweetened with stevia. 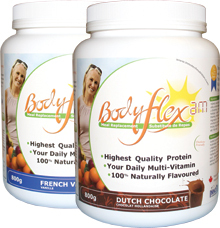 Bodyflex AM does not contain any sugars or high glycemic ingredients, chemical sweetners or fillers. Bodyflex is great when added to a fruit smoothie to ensure that you are getting your complex carbs and fibre from the fruit. Medicinal Ingredients: Whey Protein Isolate 20 g, L-Glutamine 4000 mg, L-Lysine HCl 3000 mg, L-Aspartic acid 2000 mg, L-Threonine 1700 mg, Glucosamine HCl (Vegan) 500 mg, Vitamin C (Sodium Ascorbate) 400 mg, Vitamin D3 (Cholecalciferol) 10 μg or 400 IU, Vitamin E (d-alpha tocopheryl acetate) 140 mg AT or 300 IU, Calcium (Calcium Citrate) 210 mg, Potassium (Potassium Gluconate) 185 mg, Phosphorous 130 mg, Magnesium (Magnesium Citrate) 84 mg, Zinc 20 mg, Thiamine (Vitamin B1) 10 mg, Riboflavin (Vitamin B2) 7.5 mg, Manganese 7.5 mg, Niacin (Niacinamide) 3 mg, Iron 2.5 mg, Folic acid 1000 μg, Biotin 500 μg, Vitamin A (Palmitate) 1000 IU, Vitamin A (Beta-carotene) 1000 IU, Selenium 65 μg, Chromium 37.5 μg. Non-Medicinal Ingredients: Chicory root extract, natural vanilla flavor, natural chocolate flavor (Bodyflex Chocolate only), stevia leaf powder, sea salt 95 mg.
Customers report success with blood sugar control, weight loss, acid reflux relief, improved immune system (less sick days), improved joint flexibility, more energy, healthier hair, smoother skin, less sugar cravings, quicker recovery after workouts, muscle tone, less aches and pains, even cholesterol and blood pressure improvements. See the Cardioflex Q10 page for an effective heart health formula. 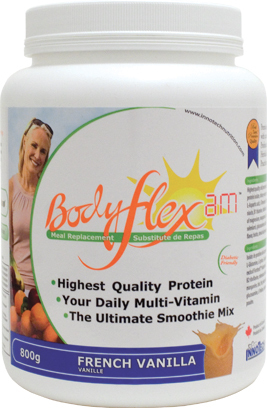 "We think the Bodyflex AM shake is a great product. I have lost 15 pounds, and my wife has lost 21 pounds. Without busy schedules we do not eat very healthy at lunch or supper, so having the Bodyflex AM shake as a healthy balanced breakfast is perfect for our family. We have been using the shake for approximately a year now and we are happy to say we have more energy, and my joint problems have completly gone away." "For years my two kids have had cereal for breakfast because I don't have anytime to cook a proper breakfast for them every single morning. I make a Bodyflex AM smoothie in the morning for all of us, including my husband, and I feel confident that my children are getting the proper nutrients that their body demands. It is that easy. My skin feels smooth, my hair is healthier and I have also lost 8 pounds in two months." "Since I have been on the Bodyflex AM program, I feel more energetic, I have less pop cravings and if I have a smoothie for breakfast, I'm not hungry until noon. Lately, I have had a problem with stiff joints but having a shake five times a week alleviates this stiffness." "I have lost 35 pounds in 5 months on the Bodyflex AM shake. My doctor is quite impressed with my whole turn around. I feel great! I follow the Bodyflex AM nutrition program as well and have a shake 4 - 5 times a week in the mornings." "This product is unreal. I can workout longer, I have more energy during the day and my recovery period after workouts has been cut in half. I have taken many protein supplements before and none have tasted this rich or mixed this well. I have to say I feel healthier and more complete nutritionally." "I have used many competing products and there is nothing else out in the market today that compares with the quality of the Bodyflex AM shake. I consider myself to be "in shape" and use the Bodyflex AM shakes as a healthy alternative for breakfast and after exercising." 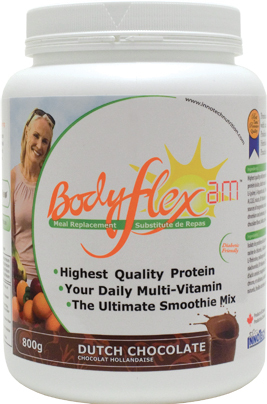 "I am 67 years of age, I have a Bodyflex AM shake every morning with fruit and flax. I have lots of pep, my digestion has improved 100% and I don't feel weak and tired anymore. I have now been taking the Bodyflex AM shake for one year and I am now enjoying each day to the fullest. I have 3 of my fiends taking Bodyflex AM as well." "Since my car accident 5 years ago, I have had difficulty with walking and flexibility in my legs. Bodyflex AM has helped me immensely. My friends have all made comments on the great improvements they have seen me overcome and seeing that my body is getting back into shape. I use the Bodyflex AM shake as my breakfast 5 times per week and have seen a significant improvement with joint movement and muscle function." "Since being on Bodyflex AM I have lost 53 lbs. When I started taking Bodyflex AM I weighed 308 lbs. and now I am down to 255 lbs. I have more energy and I find it easier to go walking and to exercise." "The Bodyflex AM protein shake is giving me more energy; I am outworking a 30 yr. old man at work. I also have less aches and pains&mash;my chronic back and knee problems are reduced." "I am a bodybuilder and rely on my Bodyflex AM for the protein, the energy that it gives me and it's ability to fill me up. I ran out of it just recently and I hadn't been able to run to the store to get more. My roommate had another protein shake at home that she was taking, so I decided to try it. I noticed that I was hungry right away and that it didn't fill me up - I didn't feel as good as I do when I am on the Bodyflex. I had to go out and buy more Bodyflex because there was no way I was going to try the other protein stuff again. I could definitely notice the difference when I started taking my Bodyflex again." *When choosing to order a quantity of each flavor, simply select the flavor and quantity to order for one and add to your cart, then do the same for the other flavor. You will see a processing message after clicking the "Add to Shopping Cart" button for each desired order. Disclaimer : The statements regarding these products have not been evaluated by the Food and Drug Administration. These products are not intended to diagnose, treat, cure or prevent any disease. The information on this Web site or in emails is designed for educational purposes only. It is not intended to be a substitute for informed medical advice or care. You should not use this information to diagnose or treat any health problems or illnesses without consulting your physician. Please consult a doctor with any questions or concerns you might have regarding your condition. To find a naturopathic doctor in Canada, go to www.cand.ca. In the United States, go to www.naturopathic.org. Start with a good blender; add one tablespoon each of organic flax and hemp seeds, one teaspoon of organic chia seeds, and 1 - 2 cups of high antioxidant whole frozen or fresh low glycemic berries. I prefer a mix of blueberries, blackberries and raspberries. Add 1 - 2 cups of water and ice and begin blending. Once the seeds and fruits are mostly crushed, I slow the blender speed down and add one scoop of my favorite super greens powder and one scoop (25 - 30grams) of Bodyflex AM. I let it further blend for only 5-10 seconds as blender blades can harm the structure of protein powders and should not be used except to blend or stir in the protein at a last stage of preparation.